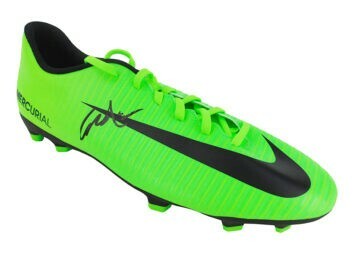 Shop for signed Tottenham Hotspur memorabilia including football boots, shirts and autographed photographs. Most items come with a photo of the signing, All Spurs signed items come with a certificate of authenticity, free UK delivery and fast worldwide shipping. White Hart Lane residents Tottenham Hotspur are widely recognised as cup specialists in the Premier League. Their gleaming trophy cabinet features a veritable treasure trove of silverware – the product of an incredible eight FA Cup wins, two Premier League titles and two Europa League triumphs. The club first opened its doors in 1882 at Tottenham Marshes, moving twice before finally settling at the iconic White Hart Lane. The characteristic rooster emblem Spurs are well known for is said to have originated from Harry Hotspur, the medieval nobleman the club was named after. He was known to have fighting cockerels fitted with spurs, hence his now infamous nickname. Spurs’ motto ‘to dare is to do’ (‘Audere est Facere’ in Latin) is befitting given their intrepid dedication to the game and constant search for victory when playing on a national and European level. They were the only non-league team to win the FA Cup back in 1901 – a triumph that almost certainly shaped the club’s future for years to come. Their fierce rivalry with neighbours Arsenal culminates in thrilling head-to-head fixtures dubbed the ‘North London Derbies’. Throughout the club’s illustrious history many career-making moments and breakthroughs – from Gazza’s unforgettable free kick at the FA-Cup Semi-Final in 1991 to their 5-1 triumph against Chelsea in 2001. Spurs fans will love our spectacular range of signed Tottenham Hotspur shirts, boots, & photos are autographed by some of the club’s most famous alumni. 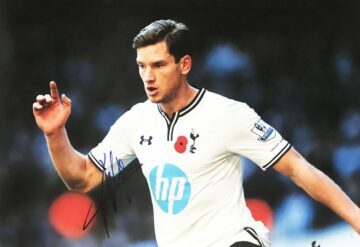 Whether you are a long-time collector of signed spurs football memorabilia or this is your first foray into the world of autographed ephemera, we have a variety of exclusive items for you to choose from. Each and every one comes straight from the source with provenance or from accredited dealers, supplied with a certificate of authenticity to ensure credibility. If you would like advice or information on mounting, aftercare or display options please don’t hesitate to get in touch. Glory glory Tottenham Hotspur!